So, a little later than expected, but I’m finally posting about my trip to Colorado for the Pikes Peak Writers Conference. if you can manage it, go to this conference. DO IT DO IT DO IT! A year ago, my friend David told me he was attending PPWC and said me it would likely be my thing, but due to timing and uncertainty over housemates and leases, I couldn’t commit to it. After he attended, he informed me I had to attend in 2015. I trust his opinion, so I agreed! I was excited, but also a bit nervous. I was meeting several people in David’s critique group from PPWC14 for the first time in person, and could only hope jetlag and nerves wouldn’t put me on the weird side of eccentric. But I was mostly excited. Put a bunch of writers together in one place and it turns into this delightful atmosphere of geekery, popular culture, books, characters, and TV shows. It basically reaffirms your secret hope that the human race is going to be okay. I was SO EXCITED that, two hours into my Dublin – Chicago flight, not even my seat neighbour accidentally knocking my fresh, scalding cup of tea into my lap destroyed my determination to have fun. Can’t say the same for my trousers, though. Cue having to inform people that purchases of burn cream and plasters were in our future. It also led to an amusing moment of Irish-American relations breakdown when I couldn’t remember what plasters were called in the US (band-aids or bandages, in case you were wondering). The rest of the trip thankfully passed without incident (I made friends with a Buddhist in O’Hare) and I arrived at Denver, burbled at my friends, cooed at David’s cats, and crashed just in time for the Thursday prequel part of the conference. The conference both lasted ages and sped by in a blur. After an unfortunate combination of jetlag and altitude sickness (and possibly unintended burn-related dehydration) knocked me out Thursday evening for around ten hours–they’re really not kidding about the altitude: DRINK WATER. THEN DRINK MORE WATER–the rest of the three days were amazing. David kept saying for the past year that he’d found his tribe, his people, at PPWC, and I didn’t quite understand what he meant. By Friday night, I did, and I felt the same. I’m so glad the internet exists because it broke my heart these people live a continent away from me, and it’s humbling to be part of an incredibly talented critique group. And I met so many amazing, interesting people, from random conversations to congratulating and encouraging them after critique sessions. 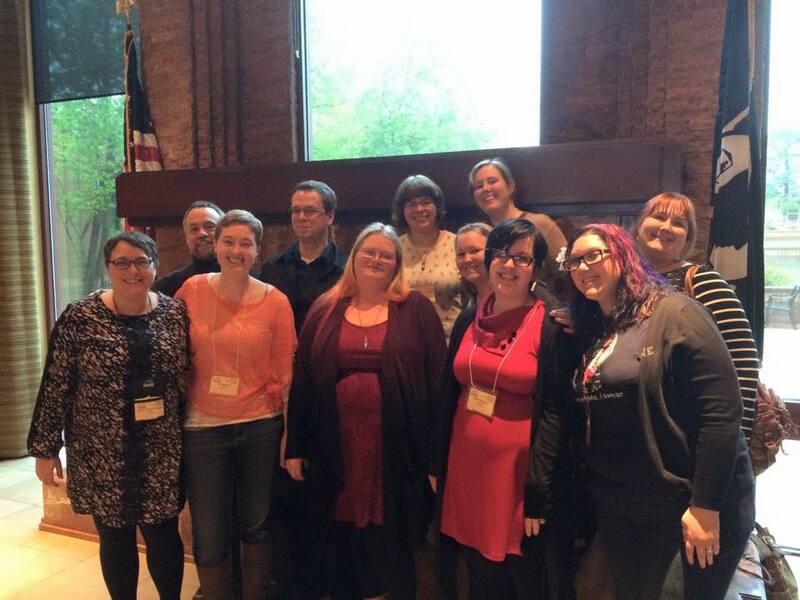 PPWC prides itself on being the friendliest writers conference, and it really is. The majority of our group signed up for general page critiques, most of which were open to the conference public, and we all tried to attend each other’s in mutual support. I would highly recommend attending as many of the open sessions as possible, just to learn: the feedback is useful and a good tool in learning to recognise flaws in our own work. One editor’s critiques were generally so informative, a friend and I briefly thanked her when we met her on the last day. The panels ranged from world building to resonance to humour, and some of them I can only describe as epic. I came home with pages and pages of notes, ones that I’ll actually be referring to as I continue revising. When they opened early registration on the last day, I immediately signed up for it. Me, who won the unofficial award for Most Distance Travelled To Get There. And I’ll happily travel all that again next April. Just without the tea spillage this time, thanks. Take vitamins and fish oil; Colorado’s climate is super dry (I have very greasy skin; it was distinctly odd to relive my days of pre-puberty dry skin in the morning!). Hands wipes are also good to keep the potential Con Crud at bay. Chocolate covered espresso beans are a very good idea. I’m bringing some next year. Don’t worry if you flub things in your first year. Next year, you’ll know what to expect and will be prepared! Absolutely try the keynote signature cocktails the Marriott staff dream up.